Hobbies: Outdoor adventures, martial arts, dancing, meditation, and personal growth work. Three words to describe you: Adventurous, tenacious, and charismatic. What's your personal claim to fame? Being a mother. I studied nonviolence and Gandhi while at UC Berkeley. I am inspired by how he was able to use nonviolent resistance in a positive way. His profound spirituality and belief in justice altered history. There are two powers: love and fear. I like to focus on the power of love. A journal so I could write, music to dance, sing, and have fun, and a picture and letter from my family to feel amazingly loved, as I also send them love daily. I am a more outgoing, adventurous Denise Stapley. Also, I can relate to the ones who are tough, athletic, and say it like it is, but also have a softness to them. TO WIN! To win the million dollars! 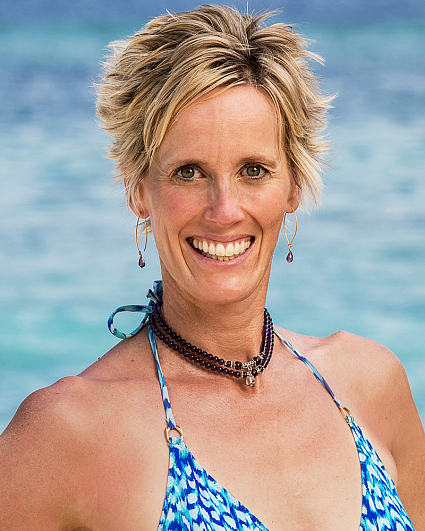 I love to challenge myself, and allow my own intensity to thrive in a game like Survivor. I am also fascinated by human dynamics and what happens to people in these situations, and cannot wait to see how I handle it myself. I love seeing what I am made of. Because I can win! I know how to win. Just like I went from farm town girl to Olympic swimmer (swam for the USA 1985-1991, and 1988 Olympics), I am tenacious and great at convincing others to support me. They feel good about themselves around me and value me, thus being okay with me being the winner.